A look back on the week that Chicago was colder than Antarctica. As most have probably heard, in the last few days of January, the midwestern United States experienced some of the coldest temperatures on record, dropping to as low as 40 degrees Fahrenheit below zero. While the words “polar vortex” were commonly used, it is worth explaining what it is and what weather like this means. In Chicago, the temperatures reached around 30 degrees Fahrenheit below zero, or 62 degrees below freezing. At this temperature, water thrown into the air is frozen before it touches the ground and going outside at all without the right clothes and preparation is dangerous. Here in Florida, the cold temperature is not much of an issue at all, at least not relative to our friends up north. Many of us, myself included, have no idea what it is like to experience that kind of cold. The coldest I have been in personally is 5 degrees Fahrenheit, and Chicago was 35 degrees colder than that. What caused these cold temperatures, however, is a much more understandable topic, even for us in the South. The atmosphere in the Arctic is, as you might expect, extremely cold, and it is very low pressure. While it is normal for this polar vortex to expand in the winter, sometimes the edges weaken, and the jet stream that borders it moves farther south than normal, causing the vortex to expand far more than usual. Additionally, when the vortex weakens it often becomes even colder, which helped add to the effect. 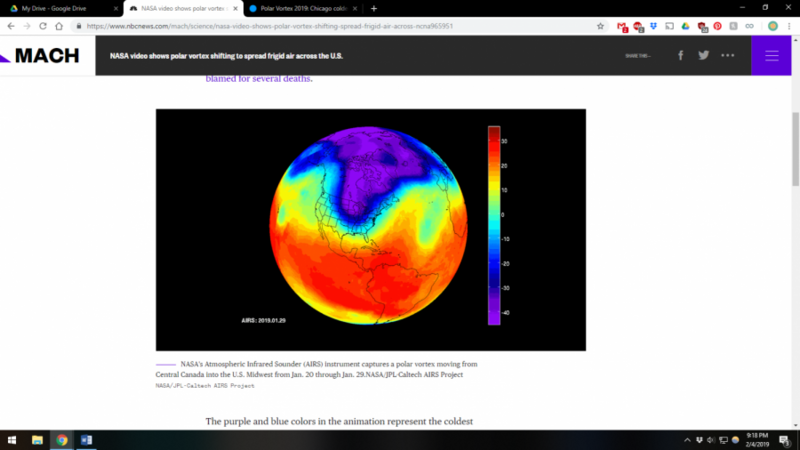 Thus, the jet stream moved south and the vortex that normally stayed above Canada and Alaska and countries of those latitudes affected much more than it usually does.